Line a baking sheet with parchment paper. Lay the pie crust on the parchment and set aside. In the bowl of a food processor, combine the walnuts and chocolate chips. Pulse until the mixture has an even texture. 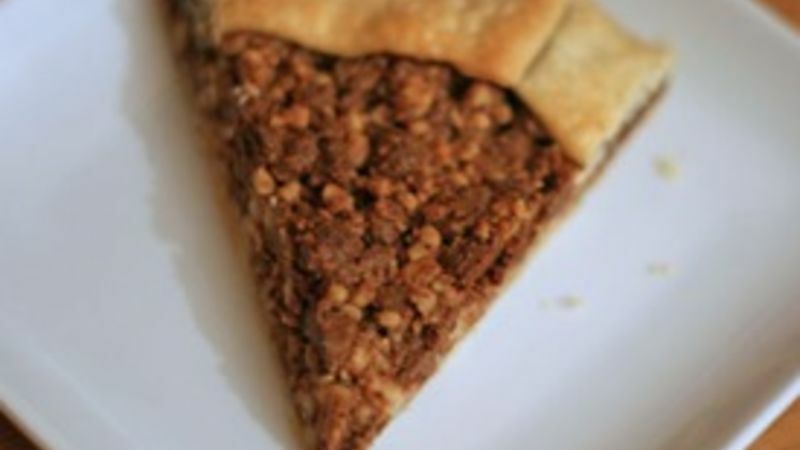 Pour the walnut-chocolate mixture onto the center of the pie crust and spread out into one layer, leaving about an inch of untouched crust at the edge. Fold the outer bit of crust over the filling, crimping as you go. Bake the pie for 30 minutes, until the crust is lightly browned. Let cool for five minutes before serving.